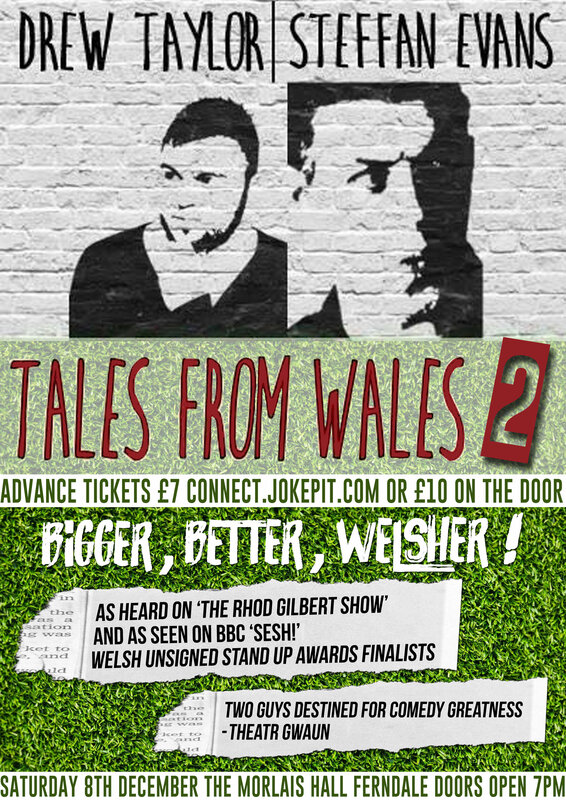 "Two of the fastest rising stars of the Welsh comedy scene" (standupforcomedy.co.uk) return with their bigger, better and Welsher stand-up comedy show, Tales from Wales! Drew Taylor and Steffan Evans, who’ve been described as “two guys destined for comedy greatness!” by Theatr Gwaun, bring an extended, improved and updated version of the show to multiple venues across Wales and beyond! As heard on The Rhod Gilbert Show, The Jamie Owen Show and seen on BBC Wales’ SESH! comedy web series. Sharp observational comedy at its best, 'Tales from Wales' touches on all the hard hitting and important topics such as; Welsh identity, the origins of the Welsh flag, the importance of bilingualism and the benefits of playing hours of Subutteo as a child... Not to be missed! Please Note - The show will consist of Steffan and Drew performing a 45-60 minute comedy set each with a 15 - 20 minute interval in between each act. For this event only, alcohol will be available in cans and small glasses of wine only. Tickets will be £10 on the door. Please buy in advance to save money, avoid disappointment and so we know who is coming!